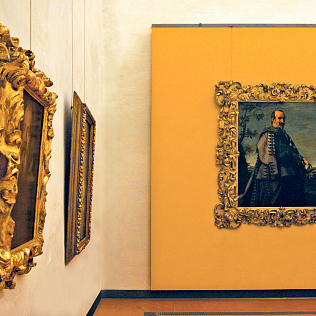 In 2013 the so-called \"Yellow Rooms\" of the New Uffizi were inaugurated: they are located in the Levante wing of the Palace. The rooms, which have long hosted the Uffizi Archives, today are the seat of the works of Florentine artists of the 17th century. Their color was chosen - after the blue and red of the other new halls - as it is reminiscent of honey-colored damask which adorned the palaces, representing the original context of many of these works. The yellow walls house the works considered the most important and significant. The rooms also have been renovated and equipped with the latest climate control and security systems. They do not follow the classic chronological order, according to which the works are arranged in the other rooms of the Gallery. Here the paintings are arranged thematically: allegorical figures, still lifes, landscapes, portraits, history painting, large paintings. A sign of the desire for renewal of the Uffizi. Among the artists present, we can remember: Jacopo Chimenti known as Empoli, John Bilivert, Filippo Napoletano, Justus Sustermans, Francesco Furini, Carlo Dolci. The works housed in these rooms come in part from the Vasari Corridor, but also from the deposits of the Uffizi.